How can we increase police diversity? What would it take for overwhelmingly white police departments to look more like the communities they serve? Officers from departments that look more like their citizenry say it requires diverse recruiting methods and an acknowledgement that efforts should be made to attract minority candidates. “We cannot rely on what comes through the door or minority populations will be underrepresented,” Clarence Few, a sergeant in Savannah, Ga., told FiveThirtyEight, which looked at the racial makeup of the country’s 75 largest police forces, as of 2010. To boost diversity, the department has established relationships with historically black schools, targeted advertising in publications with minority readers and advocated for minority recruits internally, the story said. 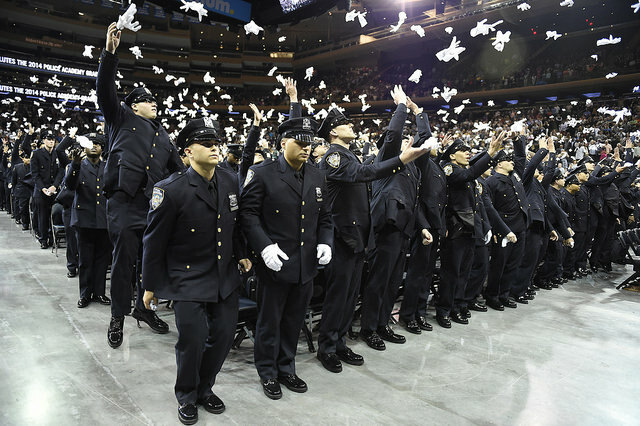 As a result, white officers are only slightly over-represented on the force, though black officers are still underrepresented, according to the publication’s analysis. Compared to the city’s majority black population, Hispanic officers are also overrepresented. Many departments fall short, including Pittsburgh, which actually saw diversity decrease in recent years, as Pittsburgh City Paper reported last summer. From 1975 to 1991, the department was required to hire black and white officers in equal numbers, but that quota system was scrapped by a judge in 1991. Only 13 percent of Pittsburgh’s officers are black, according to the department’s recent annual report from 2013. The city’s 2010 census population was 26 percent black. Whites make up 85 percent of the force. Philadelphia has a more diverse police force (and a lower percentage of white citizens), but the makeup of the force still fails to match the city’s demographics, according to FiveThirtyEight. Present day Los Angeles has one of the most representative police forces in the county — though this wasn’t always the case. Under the auspices of Bill Bratton, now the commissioner of New York City’s police department, LAPD’s demographics changed radically, in large part because the force needed to compensate for a high attrition rate during the scandal-plagued years. According to a 2009 Kennedy School study, “in 1990, just over 30 percent of the graduates from the [Los Angeles Police] Academy were Latino, 19 percent African American, 5 percent Asian or Filipino, and fully 45 percent Caucasian. Almost two decades later in 2008, 53 percent of graduates were Latino, 7 percent African American, 11 percent Asian/Filipino, and 29 percent Caucasian. Starting in 2000, the Justice Department demanded that the L.A. department make reforms. Now LAPD considers its minority officers some of its best recruitment tools, the story said. The department helps applicants prepare for its recruitment tests and sponsors test-taking events, the story said. Seminars are also held so recruits are prepared for interviews. But do diverse police forces lead to better policing? That’s a difficult question. Conflicting studies show that black officers get both more and less cooperation from black communities. Those studies also give conflicting results on whether those officers treat black communities better or worse than white officers. As the story notes, diversity doesn’t inherently create trust. But it does remove a major obstacle. “When it comes to role models or empathy, it would certainly be extraordinarily valuable if the police force could reflect our communities,” Milwaukee police chief Edward Flynn told FiveThirtyEight.